Description: These thoroughly accessible works are all from the mid-1990s to mid-2000s, and are thus cast in the tonality-based language that characterizes the composer's recent output. La Nuit de Bordeaux, a commission from the city where Goya died, is an homage to the great painter, and specifically makes reference to his late etchings. To this end, the work has a precise clarity of line in its various contrasting sections, played without a break. Busy, motoric sections for the ensemble alternate with intricate, fantastical passages with the guitar as prominent soloist. 'Tapestries and Follies' also refers to Goya. Quasi-minimalistic fast-paced music, suggesting the spun threads of tapestries brackets a series of whimsical episodes, some featuring an improvisatory feeling and a more extended, chromatic harmonic vocabulary. Some sections emphasize color and timbre; others are more straightforwardly melodic, with the two instruments equal partners in dialogue. Verde Viento consists of ten brief movements, inspired by metaphors from the poetry of Lorca. These are subtle, enigmatic, aphoristic, all of widely varying character, texture and adherence to tonal or modal relationships. The appealing Partita consists of five movements which play with reflecting forms in various senses. 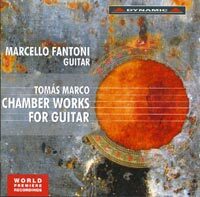 The first is lively, shimmering; the second and fourth employ 'exotic' scales; the third and fifth are perpetuum mobile movements in characteristic guitar textures, 'reflecting' each other and an earlier piece by the composer. The brief flute and guitar work consists of little repeating gestures with a picturesque, ritualistic character. Marcello Fantoni (guitar), Quartetto Archimia, Stefano Sanzogni, Marco Ramelli (guitars), Davide Gandino (flute).